Making your inner judge work for you. I’ve recently met my Inner Critic, who from now on I’m going to call my Judge, because it’s funnier and seeing the Critic as cartoon-like helps me be able to make him seem (I think of the Critic as male for some reason) less intimidating and scary. I mentioned that the Judge, while keeping me trapped on a very thin tightrope, making me afraid of a lot of things, really is trying to protect me. Unfortunately the Judge’s overbearing manner can be abrasive and downright abusive, attempting to keep me trapped in old shaming thinking patterns (which apparently it thinks are best because it’s a big clueless dummy). You need your Inner Judge, because it keeps you moral and doing the right thing. It also gangs up on you when you’ve let others step on your boundaries or abuse you (“how could you be so stupid to let that person take advantage of you AGAIN?”) The problem is, the voice isn’t very nice and feeds into your already low self-esteem. It makes you feel like a bad person–or a pathetic loser. As a result, you can be afraid to take any action. For me, although I’ve used all the Four F’s, my primary defense has been and still is Dissociation. Pete Walker talks about the Four F’s of C-PTSD–Fight (narcissism), Flight (obsessive-compulsiveness and workaholism to escape), Freeze (dissociation; withdrawal from humanity, self-isolation), and Fawn (being codependent). The trick is to make your Inner Judge work FOR you instead of against you. My therapist had me try to think of “him” as being afraid rather than mean and judgmental. By having compassion for your Judge, you can actually change the way the Judge talks to us. 1. You are worthless. You never accomplished anything of any value. 2. Who would listen to you? You think you’re some kind of expert? What sort of credentials do you have? 3. You’re over the hill and it’s too late for you. You will die poor, miserable and alone. 4. All your friends and everyone in your age group are making more money than you, own their own homes, can go on vacations, have real careers, etc. 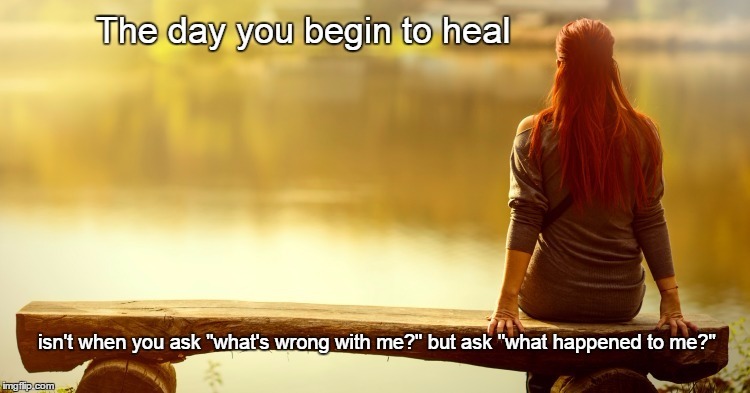 What’s wrong with you? 5. All your friends are still married or re-married, but you don’t have anyone and will never find anyone else. You’re too old to find anyone now. 6. You’re so weak and such a pushover. 7. You are too crazy to have a good life. You have too many mental issues. 8. You made bad choices, that’s why your life is like it is. 9. You’re embarrassing to be around and are socially awkward so it’s best if you keep your mouth shut. 10. Your accomplishments aren’t real, they don’t really count, so bragging about them makes you look like a narcissist. 11. What is wrong with you? 1. You are worthwhile. You have accomplished as much as you have been able to, and that’s enough for right now. 2. Many people enjoy your blog and tell you how much it’s helped them. You have friends who love talking to you and like your insight about things. Just because you don’t have a piece of paper deeming you as an “expert” doesn’t mean you don’t know what you’re talking about. You have the expertise of life experience, which is more valuable than any degree. 3. You’re never over the hill. Age is just a number. We evolve with age and get wiser. Getting old isn’t bad, but society likes to tell you it is. even if you remain “alone,” you can still have friends, happiness, and a full life. 4. You might feel envious, but many people are doing worse than you. You have many blessings, and you also shouldn’t compare yourself to others. You should only compare your accomplishments to previous accomplishments, not those of others. We are all different and have different reasons for being here. 6. You’re strong and are getting good at setting boundaries that work but are also permeable enough to let others in sometimes. 7. You are not crazy. You have PTSD, which isn’t a mental illness, but a normal reaction to a series of abnormal events. And you’re getting better every day. 8. Yes, you made some bad choices, but who doesn’t? You also made those bad choices because you didn’t have a choice but to make them (you were programmed to always make the choice that kept you from taking any real risks or chances–which usually meant not making a choice at all–and this is what kept you from growing emotionally). This was NOT YOUR FAULT. 9. You are smart and a lot of people like you. You have a right to express what you feel. 10. You should be proud of your accomplishments. Talking about them sometimes isn’t bragging, it’s showing healthy self esteem. 11. What happened to you to make you believe such outrageous lies? There was something wrong with the people who told you these lies.